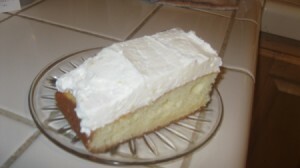 A light and fluffy lemon cake. It is supposed to taste similar to a cake Olive Garden used to have, but I never tried their cake and have nothing to compare it to. Total Time: About 4 hours total (includes chilling time). Source: Adapted from a recipe on the internet. Prepare cake as directed on the box. The original recipe is made using a 10 inch springform pan. I made mine in a 13X9 inch pan. It's a lot easier and tastes just as good! Let cool. Blend cream cheese, powdered sugar and lemon juice together, using electric mixer. In separate, medium sized bowl, whip cream to stiff peaks. Gently fold into cream cheese mixture and blend by hand. Don't mix too roughly or you'll deflate the cream! Top cake with cream frosting. I LOVE lemon cake. Especially cream cheese frosting, not to mention cream cheese with lemon in it! Thanks for the recipe, will definitely be trying this!